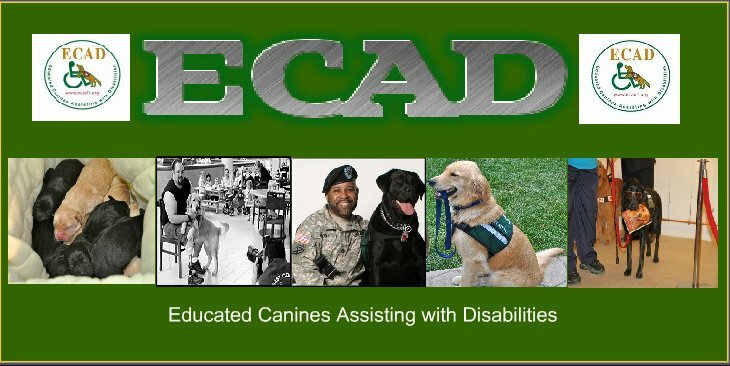 This week in ECAD Puppy training! Armani from the designer litter is working with his student handler. He is doing “Look” with objects on the floor. The Look command directs the dog to look around for whatever it is you are designated. Once mastering look he will move on to “Get it” which requires the dog to retrieve the item that you have designated. Armani is doing great having moved on to “look” for Two objects! WTG Armani and trainers! Armani has also started "up, light". Up, light means he is jumping up to the light switch and will begin practicing turning it on and off. His zipper & jacket/hoodie skills are real good and he seems to enjoy doing this task a lot. Chanel marched in the Throgs Neck Parade St Patrick’s Day Parade with her home handler , sporting a bandana and seemed to have to problems at all with the drums and bagpipes. Chanel is a natural parade marcher not being effected by any of the very loud parade distractions. Dior appears to truly enjoy working and accomplishing things for handlers. His skill levels are improving on his tugging and untugging of zippers & jackets/hoodies, looking and retrieving various items, tugging open doors etc. 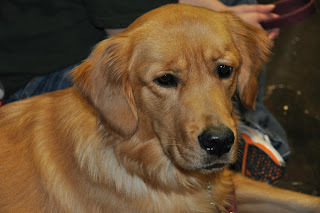 Here is Armani at a recent smooch-a-pooch event.